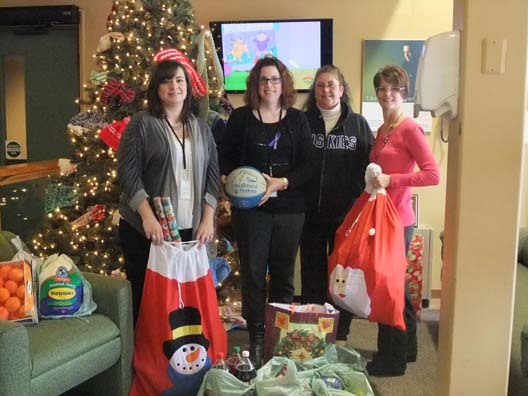 The Haldimand Huskies basketball League sponsored a Haldimand family this Christmas. Families that participant in the league were asked to bring in a monetary donation or a stocking stuffer. With the money collected, the Executive Administrator and organizer of the family sponsorship, Vicki Holdsworth was able to purchase the entire families want list for Christmas, including Christmas dinner. Accepting the donation is Chanda- Rae, a worker for the CAS, Kathleen and Sharon, basketball league moms and Vicki, wearing the huskies hoodie.